KIEV, Ukraine Ukrainian officials on Wednesday sought to reassure the public that radiation levels were unaffected at Chernobyl and there was no safety threat after a partial roof collapse at the exploded nuclear power plant. A 6,500-square-foot section of the roof over the turbine hall at the fourth power block collapsed Tuesday, Chernobyl plant spokeswoman Maya Rudenko told The Associated Press. The collapse was caused by heavy snowfall, emergency authorities said. Rudenko said the affected area is about 165 feet away from the "sarcophagus," a shelter built shortly after the 1986 disaster to contain radiation emanating from the exploded reactor. Rudenko said the radiation levels were normal and there was no danger to the public. "Everybody should be absolutely calm," Rudenko said. "Yes, it is unpleasant, but there is no danger." The April 26, 1986, accident in the then-Soviet republic of Ukraine sent a cloud of radioactive fallout over much of Europe and forced the evacuation of about 115,000 people from the plant's vicinity. A 19-mile area directly around the plant remains largely off-limits. A new giant arch-shaped confinement is currently being constructed over the old sarcophagus. The construction of the new shelter was not affected by the accident, said Anton Usov, spokesman for the European Bank for Reconstruction and Development, which runs the $2 billion project co-sponsored by the bank and international donors. 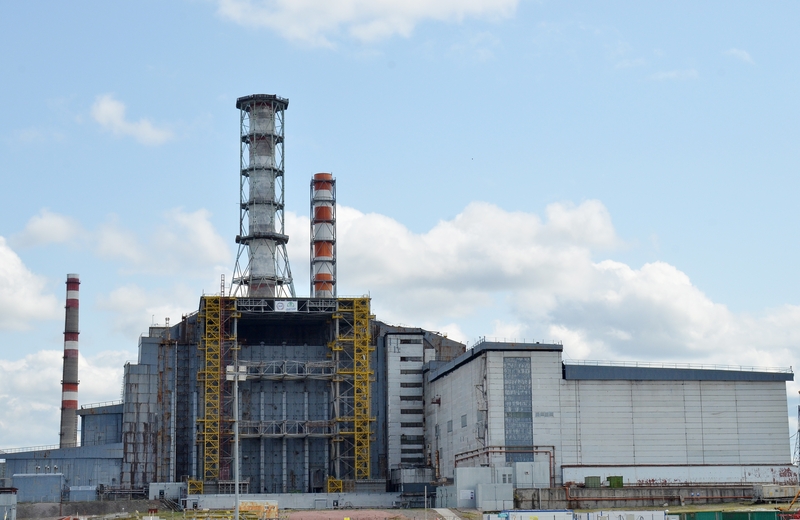 "The old shelter was not affected, the new safe confinement was not affected either," Usov said. Vinci and Bouygues, two French construction companies who are contracted to work on building the new confinement, said they had evacuated about 80 workers as a precaution. They had not returned as of Wednesday. Rudenko called that a standard measure of precaution and said the workers are expected to return as soon as an investigation into the accident is completed and the roof is reinforced in order to prevent water from getting inside. She also added that Ukrainian workers at the plant have not been evacuated or ordered to implement any additional safety measures: "We are not wearing face masks, we have not been evacuated, which is what would have happened had there been danger." However, some environmentalists expressed concern. "Even if the radiation level has not changed, it's still an alarming signal," Vladimir Chuprov, head of the energy program at Greenpeace Russia, said, according to the Interfax news agency. "If the panels in the turbine hall have collapsed, then in principle there is no guarantee that the sarcophagus, built in 1986, will not start falling apart in the near future."